Cut the papaya in half and use a spoon to scoop out the seeds. Place the flat part of the papaya on a cutting board and carefully remove the green skin with a knife. Then thinly slice the papaya and set it aside. 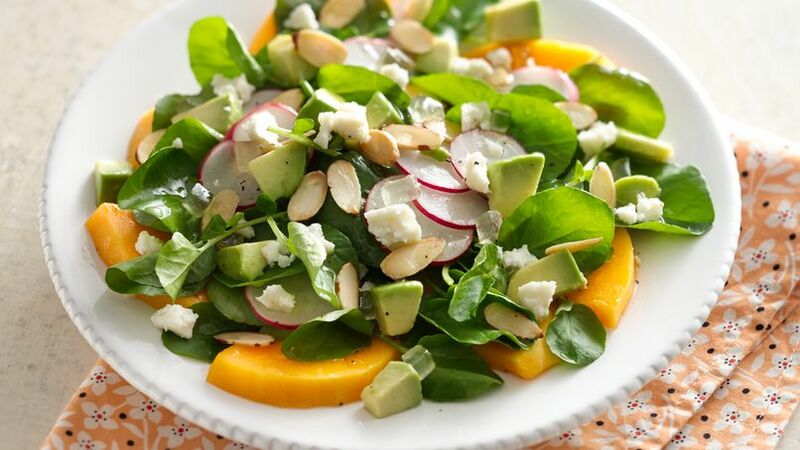 Place 6-7 papaya slices on a serving plate and top with the watercress, radishes, avocado, almonds, finger lime pulp and queso fresco. Once you're ready to serve, add the tequila vinaigrette. Vinaigrette: In a small bowl, combine all the ingredients until well incorporated. Set aside until ready to serve. If you can't find finger limes at your local store, you can order online on Amazon. Oriana Romero This delicious and refreshing salad is perfect for welcoming the summer. I invite you to make it...your whole family will love it!